Welcome to Bach One Nine, a stylish, self-contained holiday retreat in the heart of Ohakune. 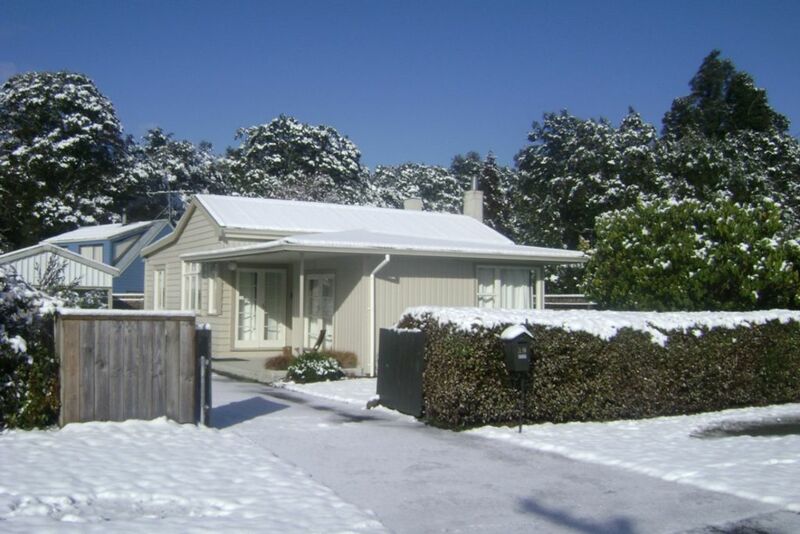 Only a 5 minute walk to Ohakune’s shops and cafes, Bach One Nine is situated in a quiet street with views of the mountain, and an easy 20 minute drive to Mount Ruapehu and Turoa ski-field. Bedding includes electric blankets on the large beds and down-duvets on all beds, whilst the new bathroom has instant gas hot-water. There's a monitored alarm for peace of mind, and a drying room for all ski and tramping gear. We accept payment by Credit Card, Online Banking or Bank deposit. Recent upgrades include re-insulation, instant gas hot water, a fully fenced section so it's safe for young children. A new queen sized bed in Bedroom One with a brand new mattress. A port-a-cot and high chair are also provided for little ones. We require a fully refundable $200 bond and a cleaning charge of $75 per stay applies. HOT SUMMER "ONE NIGHT" DEALS - If you are looking for a quick break, a night to relax after walking the Tongariro Crossing, or just a quick stopover, we offer one night stays from November through to mid June (except for public holiday weekends) at just $195 plus cleaning. Many of our return guests say that this is their home "away from home", and we pride ourselves on offering our Bach with that little extra "something" out our feedback! We also provide some pantry items (depending on what the last guests used) such as teas and some condiments. - A fully-refundable bond of $200 is required. Extras: Cleaning (Required, NZ$75.00 per stay); Linen (included); Bond (Required, NZ$200.00 per stay). Fantastic property, have now stayed there twice ! Very comfortable cottage, had all that we needed for the night. Very comfortable cottage, had all that we needed for the night. Thank you! Comfortable, close to town, great fire. Comfortable, close to town, great fire. Would stay here again. What a beautiful house! It was so homely we had a blast relaxing there after days at the mountain. What a beautiful house! It was so homely we had a blast relaxing there after days at the mountain. We will definitely stay again. Property was set up very well. Property was set up very well. Cosy and welcoming. Close to town and good location for the mountain. Peaceful stay. Great guy to deal with. House is very homely and comfortable. Heat pump is great there is a oil heater in each room and electric blankets in the two main rooms. Would definitely book this home again.